"Tickbird" redirects here. This term is also applied to other birds, e.g. the yellow-headed caracara (Milvago chimachima) of Latin America. "Buphagus" redirects here. For the Greek mythological character, see Buphagus (mythology). The oxpeckers are two species of bird which make up the family Buphagidae. The oxpeckers were formerly usually treated as a subfamily, Buphaginae, within the starling family, Sturnidae, but molecular phylogenetic studies have consistently shown that they form a separate lineage that is basal to the sister clades containing the Sturnidae and the Mimidae (mockingbirds, thrashers, and allies). Oxpeckers are endemic to the savanna of Sub-Saharan Africa. Both the English and scientific names arise from their habit of perching on large mammals (both wild and domesticated) such as cattle, zebras, impalas, hippopotamuses, or rhinoceroses, and giraffes, eating ticks, small insects, botfly larvae, and other parasites. The behaviour of oxpeckers towards large mammals was previously thought to be an example of mutualism, though recent research suggests the relationship is parasitic in nature. The genus Buphagus was introduced in 1760 by the French zoologist Mathurin Jacques Brisson with the yellow-billed oxpecker as the type species. The name combines the Ancient Greek words bous "ox" and -phagos "eating". According to the more recent studies of Muscicapoidea phylogeny, the oxpeckers are an ancient line related to Mimidae (mockingbirds and thrashers) and starlings but not particularly close to either. Considering the known biogeography of these groups, the most plausible explanation seems that the oxpecker lineage originated in Eastern or Southeastern Asia like the other two. This would make the two species of Buphagus something like living fossils, and demonstrates that such remnants of past evolution can possess striking and unique autapomorphic adaptations. The oxpeckers are endemic to sub-Saharan Africa, where they occur in most open habitats. They are absent from the driest deserts and the rainforests. Their distribution is restricted by the presence of their preferred prey, specific species of ticks, and the animal hosts of those ticks. The two species of oxpecker are sympatric over much of East Africa and may even occur on the same host animal. The nature of the interactions between the two species is unknown. Red-billed oxpeckers on female greater kudu. Oxpeckers graze exclusively on the bodies of large mammals. Certain species are seemingly preferred, whereas others, like the Lichtenstein's hartebeest or topi are generally avoided. Smaller antelope such as lechwe, duikers and reedbuck are also avoided; the smallest regularly used species is the impala, probably because of the heavy tick load and social nature of that species. In many parts of their range they now feed on cattle, but avoid camels. They feed on ectoparasites, particularly ticks, as well as insects infesting wounds and the flesh and blood of some wounds as well. They are sometimes classified as parasites, because they open wounds on the animals' backs. Oxpecker/mammal interactions are the subject of some debate and ongoing research. They were originally thought to be an example of mutualism, but recent evidence suggests that oxpeckers may be parasites instead. Oxpeckers do eat ticks, but often the ticks have already fed on the ungulate host and no statistically significant link has been shown between oxpecker presence and reduced ectoparasite load. Oxpeckers have been observed to open new wounds and enhance existing ones in order to drink the blood of their perches. Oxpeckers also feed on the earwax and dandruff of mammals; less is known about the possible benefits of this to the mammal, but it is suspected that this is also a parasitic behaviour, however, they do not harm the mammals that they reside on since they feed on little parasites. Some Oxpeckers hosts are intolerant of their presence. Elephants and some antelope will actively dislodge the oxpeckers when they land. Other species tolerate oxpeckers while they search for ticks on the face, which one author says "appears ... to be an uncomfortable and invasive process. 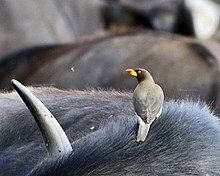 The breeding season of the oxpeckers, in at least one location, is linked to the rainy season, which affects the activity of their mammalian hosts and the tick loads of those hosts. Both courtship and copulation occur on their hosts as well. They nest in holes, usually in trees but sometimes in other types of cavity, including holes in walls. The nests are lined with grasses and often with hair plucked from their hosts and even livestock such as sheep which are not usually used. 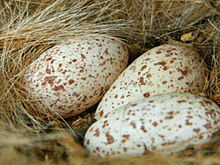 The typical clutch is between two and three eggs, but the red-billed oxpecker may lay up to five eggs. Wikimedia Commons has media related to Buphagidae. ^ Eschner, Kat. "Those Little Birds On The Backs Of Rhinos Actually Drink Blood". Smithsonian. Retrieved 2019-03-09. ^ Brisson, Mathurin Jacques (1760). Ornithologie, ou, Méthode contenant la division des oiseaux en ordres, sections, genres, especes & leurs variétés (in French and Latin). Paris: Jean-Baptiste Bauche. Volume 1, p. 32; Volume 2, p. 436. ^ Jobling, J.A. (2018). del Hoyo, J.; Elliott, A.; Sargatal, J.; Christie, D.A. ; de Juana, E., eds. "Key to Scientific Names in Ornithology". Handbook of the Birds of the World Alive. Lynx Edicions. Retrieved 11 May 2018. ^ Cibois, A.; Cracraft, J. (2004). "Assessing the passerine 'tapestry': phylogenetic relationships of the Muscicapoidea inferred from nuclear DNA sequences". Molecular Phylogenetics and Evolution. 32 (1): 264–273. doi:10.1016/j.ympev.2003.12.002. ^ a b Zuccon, Dario; Cibois, Anne; Pasquet, Eric; Ericson, Per G.P. (2006). "Nuclear and mitochondrial sequence data reveal the major lineages of starlings, mynas and related taxa". Molecular Phylogenetics and Evolution. 41 (2): 333–344. doi:10.1016/j.ympev.2006.05.007. ^ Lovette, I.J. ; Rubenstein, D.R. (2007). "A comprehensive molecular phylogeny of the starlings (Aves: Sturnidae) and mockingbirds (Aves: Mimidae): congruent mtDNA and nuclear trees for a cosmopolitan avian radiation". Molecular Phylogenetics and Evolution. 44: 1031‐1056. ^ Gill, Frank; Donsker, David, eds. (2018). "Nuthatches, Wallcreeper, treecreepers, mockingbirds, starlings, oxpeckers". World Bird List Version 8.1. International Ornithologists' Union. Retrieved 11 May 2018. ^ a b Craig, Adrian (2009). "Family Buphagidae (Oxpeckers)". In del Hoyo, Josep; Elliott, Andrew; Christie, David. Handbook of the Birds of the World. Volume 14, Bush-shrikes to Old World Sparrows. Barcelona: Lynx Edicions. pp. 642–653. ISBN 978-84-96553-50-7. ^ Mikula, P.; Hadrava, J.; Albrecht, T.; Tryjanowski, P. (2018). "Large-scale assessment of commensalistic–mutualistic associations between African birds and herbivorous mammals using internet photos". PeerJ. 6:e4520. doi:10.7717/peerj.4520. ^ a b c Weeks, P. (2000). "Red-billed oxpeckers: vampires or tickbirds?". Behavioral Ecology. 11 (2): 154–160. doi:10.1093/beheco/11.2.154. ^ a b McElligott, A.G.; Maggini, I.; Hunziker, L.; Konig, B. (2004). "Interactions between red-billed oxpeckers and black rhinos in captivity". Zoo Biology. 23 (4): 347–354. doi:10.1002/zoo.20013.